The somewhat mixed, unsettled weather conditions were delivered by winds predominantly from a south-westerly quarter and, as expected, the main thrust of summer migrants began to slow. 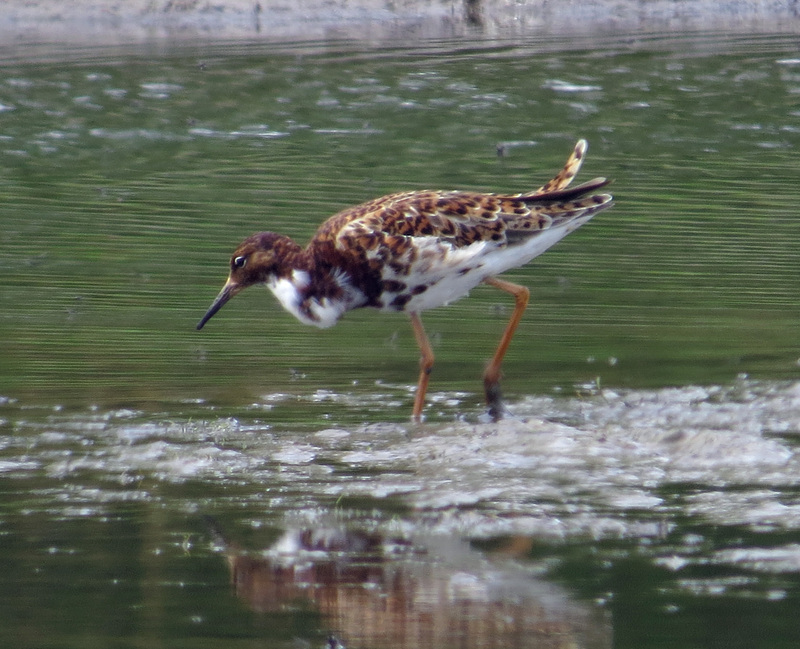 Perhaps the most notable feature of the past two to three weeks has been the paucity of passage waders which are eagerly awaited each spring. 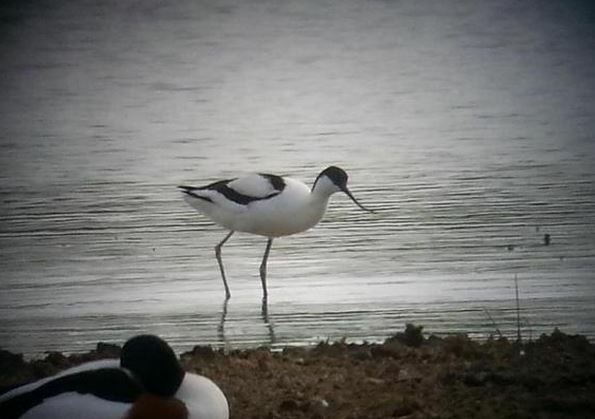 Just single records of Turnstone, Sanderling, Wood Sandpiper and Grey Plover probably make this the worst April/May for many years … and with not even a whiff of a Bar-tailed Godwit, could this be the shape of springs to come? Let’s hope not! While the Nene Valley gravel pits remained largely devoid of waders, the Great White Egret continued to appear sporadically on the scrape at Summer Leys LNR throughout the week. Ospreys were seen at Hollowell Res on 9th and 13th-14th and one was also reported flying over the A45 near Weedon on 12th but the only other raptor of note this week was a male Peregrine near Catesby on 10th. 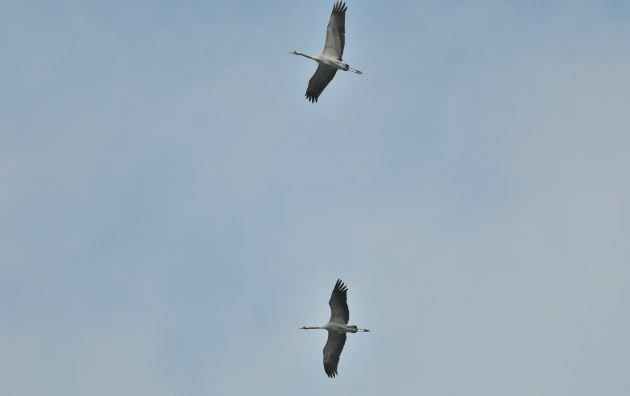 Arguably the highlight of the week was the occurrence of two Common Cranes, which flew low over Thrapston GP’s Titchmarsh Reserve at 10.30 on 15th. They quickly drifted off high but at 11.10 they were back, only to fly off high again toward nearby Thorpe Waterville. 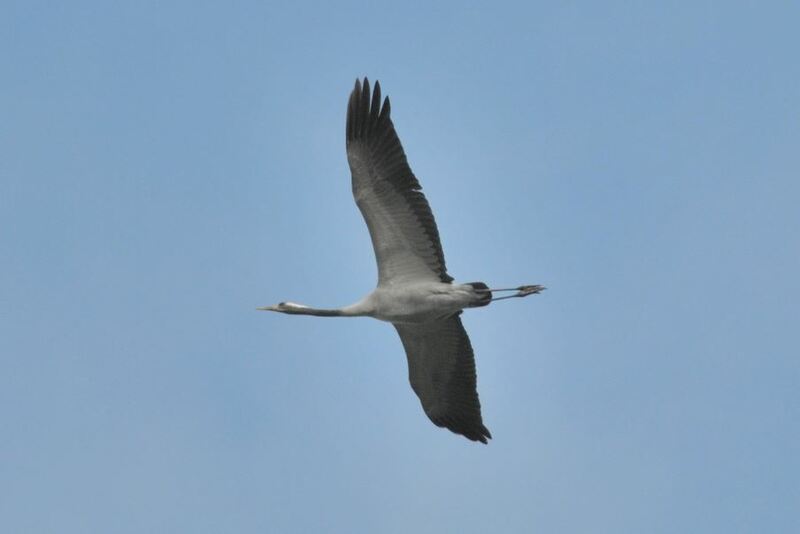 Common Crane, Thrapston GP, 15th May 2015 (John Finlayson) Record Shot. Common Cranes, Thrapston GP, 15th May 2015 (John Finlayson) Record Shot. accompanied nine Dunlins at Clifford Hill GP on 9th. Smaller numbers of Dunlin included one showing likely characteristics of the race arctica at Stanwick GP on 9th-10th, two at Summer Leys on 13th and one at Hollowell Res on the same date with three there the following day and one on 15th, while the only Common Sandpipers were singles at Summer Leys on 9th-10th and 14th, three at Stanford Res on 11th and one at Clifford Hill GP on 15th. The latter site also hosted a Greenshank on the same date. Two Redshanks remained throughout at Summer Leys, where the long-staying second-summer Mediterranean Gull remained in the Black-headed Gull colony. Another Mediterranean Gull – this time a first-summer – was in the Stanwick Black-headed Gull colony from 9th to at least 14th, while the same site produced a very good candidate for a second-summer Azorean Gull on 9th-10th. With perhaps two other possible Azorean Gulls recorded at this site in the past year or so these occurrences beg the question just what is going on with the Yellow-legged Gull complex right now and what is the true origin – both genetically and geographically – of these birds? A second-summer Yellow-legged Gull observed mating with, and apparently paired to, an adult Lesser Black-backed Gull at Stanwick this week will add fuel to the fire for proponents of the hybrid theory but observers of the ‘Azorean’ candidate say it’s bang on the money and are confident it is not a hybrid … Five more Yellow-legged Gulls were also at Stanwick on 9th – the same date that a first-summer was at Daventry CP, while these same two sites recorded Arctic Terns on 12th, numbering eight and one respectively. One of the key species cited in the recently upheld objection to proposed leisure facility development at Fineshade Wood, Nightjar, was churring at the very same site on 9th. Subsequent evening visits drew a blank, however, while the first of another late arriving summer visitor, Spotted Flycatcher, were found at both Fawsley Park and Harrington AF on 10th. Just one Common Redstart was discovered – a male at Borough Hill on 11th along with a male Whinchat, with further single Whinchats at Blueberry Farm (Maidwell) and Long Buckby on 11th and 12th respectively. Still coming through, though now likely to be wearing different genes, Northern Wheatears were found at Preston Capes and Pineham, Northampton (two) on 10th, two at Borough Hill and Blueberry Farm on 11th and 12th respectively and one at Pineham and two at Harrington AF on 13th. These latter two – both females – were trapped and biometrics duly confirmed their credentials as Greenland Wheatears, characteristics of which were also shown by the Pineham individual on the same date.